Dave, 3200m³/hr = 889 l/sec, & yup that is an axial fan. 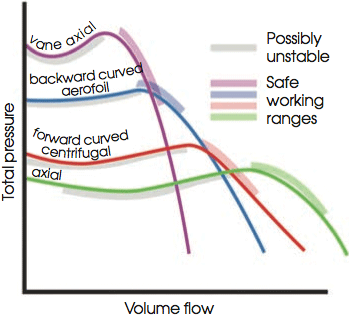 Problem with axial fans is they have very little pressure displacement across the fan as said above, and manufacturers like to quote airflow numbers with the fan tested without any ductwork on it / or induced pressure loss (free air displacement).... hence when looking at a fan curve such as the one below, you can see that some manufacturers will choose the point of most airflow at zero pascals of pressure displacement at the far right of the curves (in day job be very suspicious of any fan manufacturer not publishing a fan curve for a fan but just quoting one number without a corresponding pressure displacement). If you are adding ductwork on to it (flexible / ridgid) you need to consider the pressure loss (even roughly), and also the termination (louve, or even free air discharge), and also the intake. Interesting, luckily i have kept my ductwork to 12" on either side of fan - as short as possible so i should be at near fan capacity for flow rates. How big is your table Dave? Sorry Hood, can't remember (and 29 pages is a bit so search through...), how big is your table? The cutting area will be about 2700 x 1700. Was thinking maybe having 4 funnels like in drawing below, would give quite steep sides and could have a tray underneath with a fan in or maybe even 2 trays/fans, thoughts? Is it at all possible to get the gantry on the short axis ?? Trouble with tip-up table and fans will be disconnecting the duct work each time. The steep sides are good... It's called the angle of repose, although the metal is molten. I've tried to find the angle of repose for iron filings, but can't find the link now or source, but 60 degrees seems to be a number from somewhere. Don't have enough steel to have it the other way, could have got more but I have it done now. One side of the cones is 58 degrees, the other 68, so should be close. It will be all new stuff I am cutting and no coatings. Mainly 316 stainless and 5083 Alu. Stainless fumes are very bad news when plasma cut, I thinks its called hexavalent chromium and is carcinogenic, also la is pretty rough too i think, this is why I went for as much ventilation as I could fit in and run with the window open, even in winter to allow for make-up air. Aye, Alu is not too great, fume wise, either.